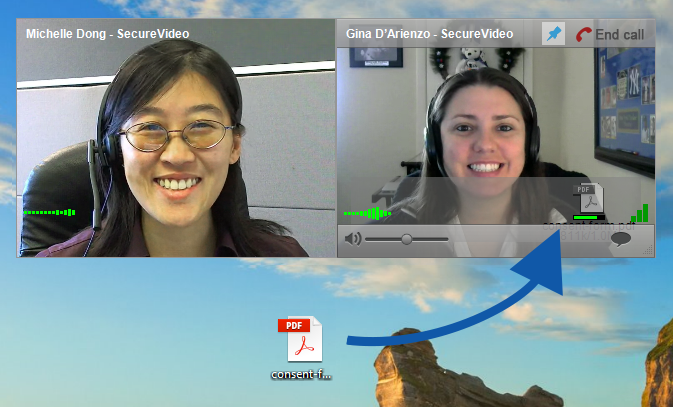 If you have a document or other file you'd like to share during your SecureVideo session, here are instructions on sending that file to the other person(s) on your videoconference. This feature is not supported on tablets or smartphones. To transfer a file, just drag and drop the file you wish to transfer onto the video tile of the party you wish to transfer it to. Depending on the size of the file, it can take between a few seconds and a few minutes to complete the transfer. Once the file appears on the recipient's video tile, the recipient can simply drag and drop the file from their own video tile onto their desktop, and then the transfer is complete.